Tickets are now on sale for the Leeds Storytelling Takeover at the Carriageworks Theatre! We’re offering a limited number of Exclusive Saturday Show Passes, so make sure you book early for this intoxicating weekend of stories, featuring legendary storytellers – Clare Muireann Murphy, Tim Ralphs, Peter Chand, Ursula Holden Gill, Xanthe Gresham Knight as well as leading European artists Damir Avdić and Erik Valenčič with their performance I, Anarchist. Launching with a MYTH OFF on Friday, and running through to a family-focused Sunday, the weekend offers an exciting mix of inspiring, dreamy, scary, hilarious, shocking, weird and downright wonderful stories. There’s even the chance to create and tell your own stories with the workshop, Discover Storytelling – Getting Started with Peter Chand. With true stories from the front line, a unique take on ‘him downstairs’, tales from Syria and Ireland, epic Persian adventures, flavours from the Punjab with a hip hop twist, plus workshops and a city centre story walk – it’s a weekend you won’t want to miss! For the full line up and how to book, go to the Carriageworks Theatre or see more on the Adverse Camber websites. Indulge yourself in a night of Indian tales with a contemporary twist, international storyteller, Pete Chand and music producer, PKCtheFirst blast traditional South Asian stories and sounds right into the 21st century. Tickets for the WHOLE WEEKEND are NOW ON SALE with a limited number of SATURDAY SHOW PASSES for all Saturday events for £50 (£40). Friday’s raucous MYTH OFF, Peter Chand’s Workshop and Sunday’s family shows are priced separately. We’re really excited that the Storytelling Takeover is a central to the very first Leeds Lit Fest, taking place from Wednesday 6 –Sunday 10 March at venues across the city. Leeds Lit Fest celebrates the vibrant and thriving literature scene that exists in Leeds with local writers, performers and artists showcasing their talents alongside those from across the UK and internationally, we can’t wait to be part of it! 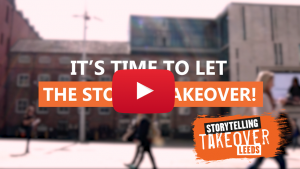 And now it’s time to… let the stories takeover! !